From my daddy’s house to my husband’s house. Brokenness is what we had. Me breaking his heart because of my refusal to marry him. My broken heart because of the pressures to marry or not to marry just because we had a baby. Engagement ring purchased. Same ring returned to the jeweler. No more words spoken between us. Just visits with his daughter. He went to working on our wedding bands (he was a machinist). 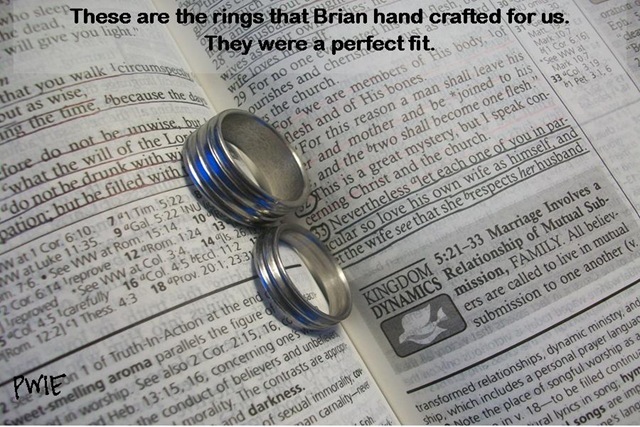 Hand-crafted bands that would symbolize our covenant. Loading the little belongings that I owned into my car. I get dressed in a blush colored dress; the only thing that fit my new mom body. I get Aubrey dressed in the frilliest dress that she owned. Brian takes off at his lunch break and tells his boss that he’s getting married today! Borrowing money from his cousin for a marriage license. Little did I know that the pay back would be my car’s stereo system (it was bumpin’!!). A total of 9 present (including Brian, Aubrey and myself) at the courthouse. My parents, one of my sisters, my aunt, his sister and brother-in-law. A blurry photo in the Justice of the Peace’s office is all that we have as proof of our wedding day. Celebration of our marriage that evening was a big pot of spaghetti…just the three of us (well Brian and I ate the spaghetti). Here I am, a homemaker, a stay at home mom at the age of 20. I loved my life with my husband and daughter, but boy did I have a lot to learn about being his wife. One thing that was made clear to me from day one is that divorce is not an option. No back doors. No disposable marriage. The world was already against us. We made a pact that we wouldn’t be against each other. We’re a team. Trudging along. Finding our way. Building our relationship. Learning more about living under the same roof with no restrictions, no looking over our shoulders anymore. Rocky beginnings. Where was the excitement? This is supposed to be enjoyable…I mean…It was BEFORE we were married! Short fuses (or as Brian would say, “no fuse at all”). Dealing with his anger. Dealing with my passivity and feeling that I had no voice. Wanting to be the best that we could be. We needed help! Receiving mentorship from couples that really cared about us. Reading books and getting our hands on any resource that would help us. Serving God. Involved in church. Improving our serve. Loving each other the right way. THEN ONE DAY! Wait…what is this? Things that I’d told my beloved husband were not true! I was 23 years old. We were in church revival. Pastor Bailey Smith was preaching the message, “The wheat and the tares” (Matthew 13:24-30,36-43). All my life I went to church. I was a good girl. I sinned a little. I knew God was real. I thought that I belonged to Him! I had told my husband that I was a Christian. I wasn’t! I didn’t mean to mislead him. God graciously accepted me as His daughter. I now have His Spirit living in me that enables me to DO and BE better! This is where the learning years truly come for both of us. Our struggles, victories, heartache, learning, precious time spent, and deeper love is what Brian and I love telling about. We know that there are many that are blessed by our story and breathe the sigh of relief in knowing that they too can make it. Our marital victories come from our personal victories.Victory in Jesus!! Freedom in God’s Word. That’s the only thing that could possibly make a difference in our lives. Brian now has a longer fuse (I say this with a smile knowing how much my man has grown and developed). There are things that we still have to work out daily. We’ll never arrive or pretend that we always have it all together. We go through different seasons of marriage; learning new things about each other, things that God is bringing to the surface for us to work on and work through. We welcome these opportunities to grow because we know that it’ll be for our good. We want our lives and marriage to glorify God. I pray that anyone reading this will draw the conclusion that God can redeem and restore. Our greatest struggle is becoming our greatest victory. There was disobedience, dishonor and sin in our relationship. We’ve been forgiven. That is never to be used against us by God. Only crying out to those coming behind us to choose God’s best.